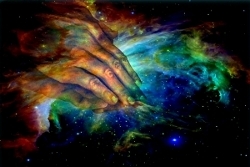 Hands of Creation by Evelyn Patrick. Several Christian thinkers have argued that general revelation, that is, the revelation that God makes of himself through nature1 –in contrast to special revelation given through Scripture, the person of Jesus Christ and faith as an experience of the Holy Spirit–, would be insufficient to provide a complete knowledge of the divine reality. In this article, I will argue in a very general manner that even if such limitation is correct, it does not implies that we must completely ignore it within the context of theological reflection, because in the contemporary scene, it becomes very necessary to value it in its right measure in order to develop important fields of action. General Revelation ... insufficient? Yes, unnecessary? No. At first, it would seem that there is no reason for controversy, however, it is a known fact that the discussion about the legitimacy of the general revelation still persists in some academic and ecclesiastical circles. Even today, many theologians, appealing to the inevitable limitation of the general revelation to provide deep and concrete aspects about God, they consider it as a secondary thing and even unnecessary in the context of missiology. Essentially, we are presented with a pragmatic gospel, in which we should gather our efforts to transmit exclusively the soteriological message of the Risen Christ, which, in turn, would constitute the starting point for a communal Christian life. It is clear that virtually all Christians agree that one of the fundamental tasks of the Church, and it was noted by Jesus himself, is to make disciples of all nations (Matthew 28:19, Mark 16:15). However, the important point is that there is no real reason to reduce the evangelistic message and Christian life solely to the saving and pragmatic aspects. Today, we live in a pluralistic society in which we coexist with a range of intellectual, philosophical and religious alternatives, and where Christianity, of course, is another option. How can we communicate our deepest convictions, if we only present them as a simple narrative without any meaningfulness outside the limits of its own religious essence? It is precisely here where the general revelation becomes really necessary, because it makes of Christianity not only a purely spiritual option, confronting reality between "spiritual" and "earthly", but rather, a truly all-encompassing intellectual alternative. It is clear that even if the general revelation is insufficient in the context of the saving faith in Jesus Christ, it becomes extremely necessary inasmuch as Christianity wants to reach out all areas of life, since, in fact, the special revelation becomes insufficient for achieving the latter due to its particular not exhaustive nature. For example, how can we reconcile the supernatural essence of the miracles with the currently predominant mechanism in the consolidated physics, considering that religious experience as such is far from being a phenomenon that can be investigated scientifically? How can we contextualize the message of Jesus Christ, when we are faced with ethical dilemmas such as economic justice, taking into account that when his theological message was conveyed the modern economic science did not even exist? How can we give a Christian meaning to the visual, musical and literary arts, when the Bible is far from being an aesthetics text? It is clear that in order to address this type of problems, neither Scripture nor personal spirituality are in themselves sufficient, since what is required is to take a much more general approach. This approach requires to assume as a starting point that nature, understood as the complex world of everyday human experiences, related to our pursuit of truth –scientific knowledge–, beauty –artistic sense–, goodness –moral sense– and the divine –religious sense–, is also a revelation in itself because it comes from God. We have mentioned the main aspects that conform nature, understood broadly as God’s creation. Now, it is important to ask ourselves: why should we worry about this kind of revelation? Are there really any fruitful, relevant fields of action where the general revelation is especially important? The answer is yes, certainly. Today, it is increasingly necessary that Christian theology uses the general revelation as a theological source, for different purposes. I will mention some of them very briefly. 1. It helps us to understand our place and destiny as human beings. Within the context of society and culture, Christianity as an intellectual, comprehensive system represents an enlightening voice on various social issues. For example, if we think about ethical issues such as to respect the person and the life, the "natural" theological reflection on the basis of general revelation gives us a valuable philosophical proposal that runs counter to the traditional reductionist view –that one about a world without any purpose, in which man is diminished to a simple biological machine, lacking freedom or without inherently meaning–, which threatens our own humanity. 2. It promotes dialogue and cooperation between Christian theology and the sciences/humanities. Once we contemplate nature –with all its richness and complexity– as a divine creation that in itself possesses value, it is coherent to establish that the intellectual implications thrown by the various areas of human knowledge must have some kind of connection with the divine reality. The interaction and cooperation between Christian theology and the sciences/humanities becomes very fruitful, because, on the one hand, it provides us a holistic approach which favors the much needed transdisciplinarity in the academy; and, on the other hand, it helps us to understand the same theological and philosophical foundations, to which the different forms of traditional knowledge owe its cause of being3. 3. It corrects our biblical interpretations. One of the virtues of the general revelation, through the various areas of knowledge, is that it works like a real veto to our biblical interpretations. For many fundamentalist Christians, the Bible is the final word as regards the divine truths4, however, when we get to the point of ignoring that it is impossible to separate the Biblical text from its several interpretations, we often run the risk of going against factual evidence. Biblical hermeneutics, due to its nature, will always provide us interpretive models that can be contextualized, reviewed and potentially corrected; and the general revelation will always be useful with regard to assessing these models. 4. It favors healthy religious pluralism. When we realize that the different religious traditions –as a consequence of our deepest sense of the divine– constitute honest approaches towards a transcendent ultimate reality, we are in real conditions to establish a fruitful interreligious dialogue. Some see this as a danger that threatens Christian orthodoxy, however, I consider this thought ungrounded, inasmuch as a dialogue with lofty perspectives presupposes that we know and value our deepest theological differences; it is much more than a mere religious syncretism. Additionally, the general revelation also provides a common basis5 on which different forms of religion can work together when it comes to important ethical issues today, such as social justice, environmental care, human dignity, among many others. General Revelation and the principle of "Sola Scriptura"
The relationship between Protestant Christianity and natural theology since its inception has been particularly complex6. In fact, one of the main criticisms raised in some traditions, is that to do theology on the basis of general revelation would be totally contrary to the Protestant principle of Sola Scriptura. For example, for the neo-orthodox theologian Karl Barth, both Luther and Calvin argued that the Church and the salvation of humanity should only be grounded in the Word of God, in Jesus Christ as the revelation of God attested in Scripture and in faith7. Here, I see two obvious problems. First, that the real goal that the principle took in the context of the Protestant Reformation of the sixteenth century is overexploited. The Sola Scriptura was formulated, essentially, to remove from the Church all sorts of redemptive practices. Now, it is true that the Reformists, especially Luther, had outbursts against philosophical reflection. However, and as noted by Methodist theologian Harold DeWolf, these were historically accidental, but not logically essential in connection with the principle that the Church should be based only on the Word of God attested in Scripture8. The second problem is that the Bible itself shows us –in several passages– God revealing himself through the natural world (Psalm 19:1-4, Matthew 5:44-45, Romans 1:20), and printing his law in the hearts of all men (Romans 2:1-2, 12-16). The work of one biblical scholar, James Barr, is of particular importance, exposed in the traditional Gifford lectures, in which he discusses how Paul the Apostle makes use of natural theology and the natural sense of the divine in his speech at the Areopagus, to transmit the Christian faith to Athenians9,10. Here, then, we can conclude that to do theological reflection based on the general revelation does not breach the principle of Sola Scriptura, but, paradoxically, is a consequence of it! Besides, and as we can see in Paul's speech, it is very useful when we need to spread the Christian faith to other cultural contexts. This article was translated by Cecia Millán and reviewed by Nicolás Manfredi. The review was done under the grant “God's Evolution” awarded to the Science and Faith Centre (Spain) by the BioLogos Foundation (USA).